WoodSpring Suites in Apex is an extended stay hotel that offers fully furnished studios with a kitchenette in a clean and safe environment. Weekly rate begins at the low price of $219.99 (taxes not included), with current weekly rate equate to just under $36 per day. 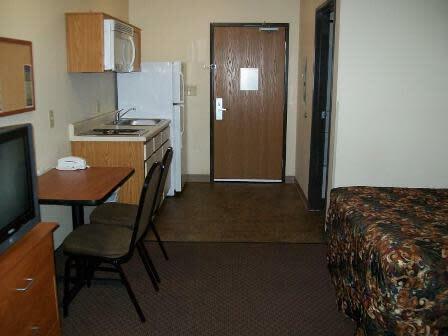 WoodSpring Suites offers affordable weekly rates with no lease so you can stay for a week, a month or even longer! This hotel is in close proximity to RDU International Airport, shopping destinations such as Apex's Beaver Creek and the Cary's Crossroads Shopping Center and Crossroads Corporate Park. WoodSpring Suites is a smart, clean and cost-efficient choice for business travel, extended vacations and temporary housing for those that are relocating to the Raleigh area and the surrounding suburban locales such as Cary, Morrisville, Holly Springs and near Raleigh.